Most of us consider ourselves to be ‘positive people.’ Or, at least, we try to be as often as we can. Sometimes though, our thoughts get the better of us. 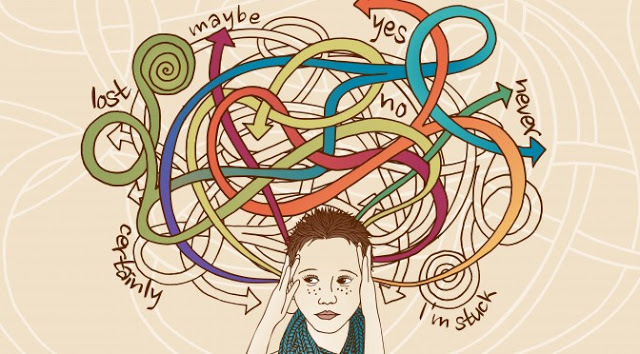 Thinking about a problem can cause an overabundance of other thoughts to follow, causing an endless spiral of overthinking. Our thoughts have power- if you think too much about something, it can cause unnecessary stress and even make you feel like you are losing your mind. That quote holds a lot of truth. How many times have you not been thinking about something, when suddenly, out of nowhere, the answer comes to you? It happens to me all the time. When we think about something that happened, and we try to analyze it, we sometimes create problems that weren’t even there in the first place. A common pattern with overthinkers is that they tend to blame themselves when things go wrong. They observe a situation and pick it apart, trying to find what they could have done differently. You need to remember to let blame go. Things happen as they happen and if you didn’t intentionally do something wrong, then you can’t blame yourself. Life gets complicated sometimes, but there is no reason to continuously blame yourself for those complications. 2. Accept change as a part of life. Change is inevitable. You can’t control every aspect of your life, and trying to will only cause more frustration. Some things you can control, and so you should work on them as you please. But some things will always be out of your grasp and worrying about them is pointless. 3. Leave “what if” alone. “What if” is a powerful tool for the overthinking mind. It can take you down paths you never would have journeyed before. This is exactly why you should leave it alone. Possibilities are great to consider, but not when they lead you to a world with only negative aspects. Focus more on the present, and not what could have been, or what might be. As an overthinker myself, I have found that using mantras during meditation, combined with relaxed breathing, improved my meditative state and allowed for more clarity. “Om Mani Padme Hum” is a personal favourite. Our self-talk is very powerful. Don’t be hard on yourself when you catch your mind engaging 5th gear. Decelerate, breathe, and focus. Be patient with your progress and speak to yourself with kind, supportive words. Overthinking took time to develop and it will take time to unlearn.